What is the Best Language Teaching Method? The Direct Method is also known as the Oral or Natural method. It’s based on the active involvement of the student in both speaking and listening to the new language in realistic everyday situations. The process consists of a gradual acquisition of grammatical structure and vocabulary. The learner is encouraged to think in the target language rather than translate. He or she hears and uses the language before seeing it written. This method grew from the traditional method of teaching Latin and Greek. The method is based on analysis of the written language using translation exercises, reading comprehension and written imitation of texts. Learning mainly involves the mastery of grammatical rules and memorization of vocabulary lists. This self-teaching method is also known as the Aural-Oral method. The learning is based on repetition of dialogues and phrases about every day situations. These phrases are imitated, repeated, and drilled to make the response automatic. Reading and writing are both reinforcements of what the learner practices. 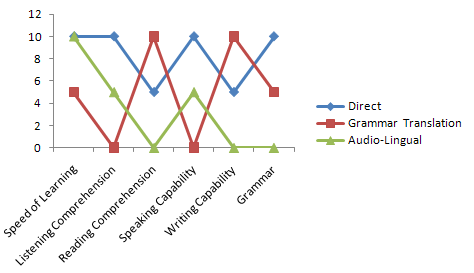 This comparison graph shows the expected results for a typical student applying the same amount of time and motivation to the learning. We scored the value of each method from 1 to 10 in the following aspects: Speed of Learning, Listening Comprehension, Speaking Capability, Writing Capability, and Grammar. The Direct Method gives the student the ability to communicate quickly because she is encouraged to be creative during practice. It gives, by far, the widest range of capability to understand what another person says to you and in developing your capability to speak. This is the method of choice for instruction with a live trainer and where speaking and listening are most important. The Grammar-Translation method requires the learner to spend a lot of time understanding the language structure. Listening and speaking suffer because of this. Understanding the structure is helpful in reading and particularly in writing. Grammar and vocabulary are emphasized throughout. This is the method of choice when the student’s goal is to achieve a high level of writing and reading ability in a foreign language, versus speaking and listening. The Audio-Lingual Method also allows the learner to communicate quickly but within the limited range that the repetition allows. It improves comprehension only if the speaker uses phrases that the learner has studied. Reading is limited, and an understanding of how to use the language is very limited. This is the method that is used when a live trainer is not available. ALTA creates customized online language training programs based on the Direct Method and the Audio-Lingual Method. ALTA trainer-led programs include placement tests, progress tests, and achievement tests to verify language skills improvement. The Audio-Lingual Method is used for specialized programs that are not trainer-led, particularly at the lower levels of initial skill. I found that the really good learners are those that can learn simply by picking up the sounds, remembering them and then mimicking them. My assumption is that these people are more right brained – i.e. creative. The more left brained people, like me have to see it all written out and understand the structure first. I’d imagine a combination of Direct and Grammar methods would be best. I talk with someone in the target language only a few times a week, plus do reading exercises using the dictionary. I keep both modes of learning independent from each other. This was really interesting… I was just wondering where the “immersion” style sits with all of these? I’m learning French at the moment and have been for a year. I started from scratch, and from the second hour of the first class, all of my classes have been delivered in French, despite no one in the class knowing any French to begin with. The focus of the ideology behind the teaching seems to be in line with the first method you describe, in trying to make us think in the language and not have to translate (eventually), and we do lots of speaking and listening in normal situations, but there is also plenty of focus on grammatical forms and writing and reading.